Good casserole dishes appeal to just about everyone. They are flavorsome warming, nourishing, and simply delicious. The good news is, they are all surprisingly easy to make! Season the beef with salt and pepper and add about 2 tbs of oil, mix well. Brown the beef in a large saucepan in 2 or 3 batches. The pan needs to be hot enough that the beef sizzles. Remove each batch and place into a casserole dish. Reduce the heat and add a little oil to fry the vegetables. When they start to soften, add the thyme and flour and mix until well combined. Gradually pour in the water and bring to the boil. Pour over the meat in the casserole dish, stir to combine, cover and place in the oven at 160ºC for about 1.1/2 to 2 hours. Give it a little stir every 1/2 hour and add more water if needed to keep the ingredients just covered. When the meat is tender and the sauce has slightly thickened, serve with white or brown rice. Add your favourite vegetables or spice up the sauce with a little Worcestershire or soy sauce. You can also add tomato paste for a richer sauce. There are endless possibilities for you to enjoy - you will soon get a feel for it. Combine all ingredients for the marinade and stir in the pork. Place in the fridge for about 15 minutes. Heat oil in a frying pan or wok and fry pork in small batches until slightly browned. Transfer to a bowl. Stir-fry carrots and beans until just tender. Add pork and remaining marinade and stir-fry until the sauce boils and slightly thickens. Season with sea salt. 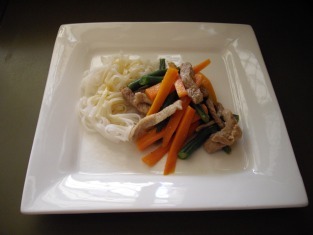 Serve on a bed of rice noodles.